The health of the Clarksville housing market is in large part due to growth at Fort Campbell, its proximity to Nashville, and of late, the opportunities afforded by the growth of new industries such as the joint venture of Hemlock Semiconductor and Dow Corning to produce polisilicon for solar panels as well as the expansion of existing industries including Bridgestone. In addition, Clarksville is also rapidly becoming a regional healthcare center with the reopening of the Gateway Medical Center in an entirely new and larger facility. Lastly, the presence of fast growing Austin Peay State University and the synergies between it and the areas large employers has helped boost local employment considerably. Just to the north of Clarksville, in Hopkinsville, KY, Brent Gilkey the 2012 President of the Home Builders Association of Hopkinsville says that “the local economy is doing well for a variety of reasons. First the food industry has held up very well despite the economic downturn, (unlike the auto industry) and Fort Campbell has been a profoundly positive influence. In addition, our industrial parks are expanding and Commonwealth Agri-Energy, which converts corn to ethanol, has been a boon to the community. Lastly, we have witnessed a steady increase in the number of retirees who move here for the many recreational opportunities and low cost of living. According to Todd Harvey, Vice President of Byers & Harvey, Inc located in Clarksville, TN, “growth at Fort Campbell has been critical to the local economy. Since 1990 the number of troops stationed there has grown from 19,000 to 35,000. And, if you add in families it exceeded 50,000 people. On top of that a new 500 person call center will soon be opening and the Sanderson Pipe Corporation is expanding here and Trane Co. and Jostens Printing & Publishing are both doing well, all of which makes the city more prosperous and more desirable than ever before.” Whatever the causes, house prices have held up well over the past few years. Prices are up 2.0% since the trough in February 2011 and are off less than 4% from their all-time high set in October 2008. Improving economic conditions have resulted in payroll employment setting a new high of 86,400, bettering the previous high of 85,700 set in August 2007 and up by 6.5% since the trough in March 2009. Single family permitting activity is up 1.5% on a seasonally adjusted monthly average basis from the trough set in May 2008. 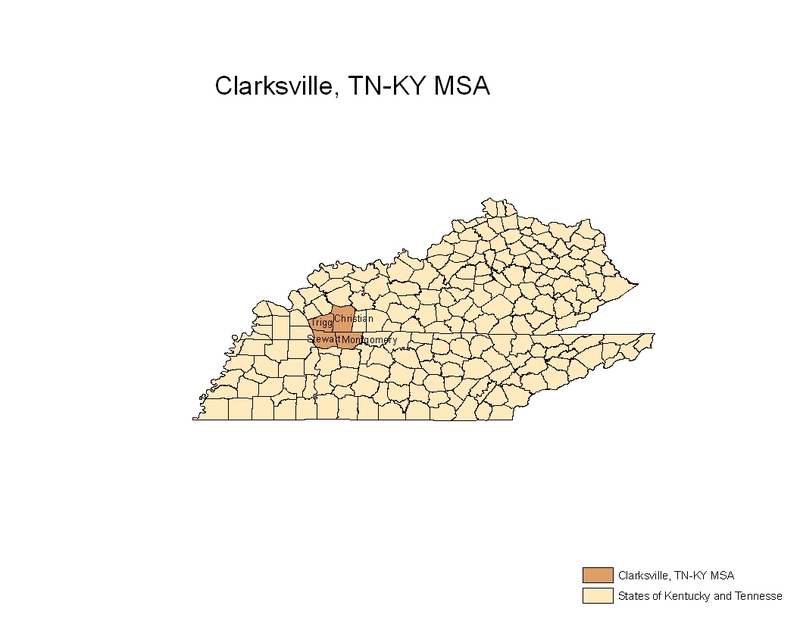 While new homes are being built in many parts of the Clarksville MSA, activity has been primarily centered north of the City of Clarksville near Fort Campbell and east of town going towards Nashville.